So how does this relate to the New World? 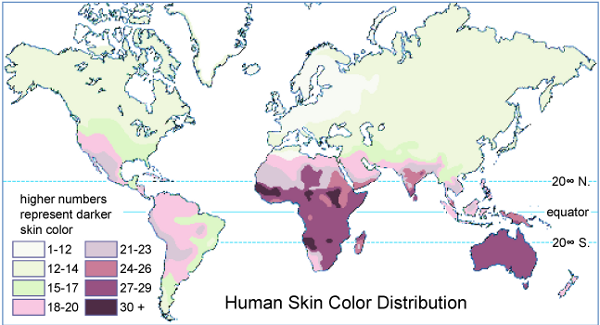 I think the difficulty in gaining function once it has been lost explains why the people of Peru or the Amazon are not as dark skinned as those of Africa, Melanesia, or South Asia . They haven’t had enough time to regain function which they lost as H. sapiens traversed northern Eurasia. So there you have it. A nice little illustration of how the genetics taught to 18 year olds can be leveraged by the insights of modern genomics and biological anthropology! In the end, nature is one. 42 Comments to "To Gain Pallor Is Easier Than Losing It"
josef, if you’re interested in the topic you’ll familiarize yourself with the literature. i think it’ll clarify/modulate a lot of what you’re saying. 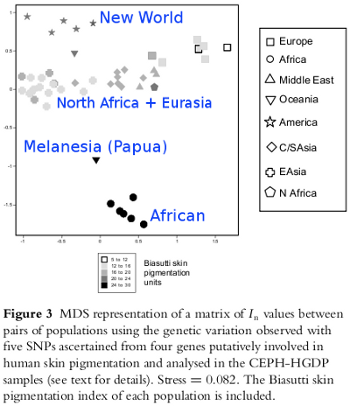 since you stated “I admit I don’t know that much about the genetic architecture behind skin color,” you’re just thinking off the top of your head. a lot of your questions would be interesting to follow up and engage with, as i think you might be correct in some areas…but i’m not really in the mood to recapitulate five years of genomics papers 🙂 the first paper is a place to start with in the literature.